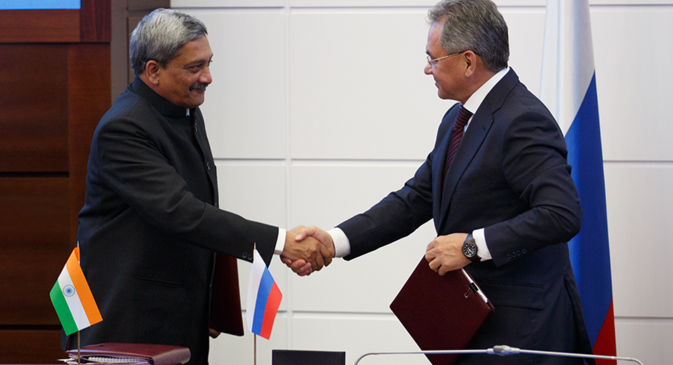 Indian Defence Minister Manohar Parrikar called Moscow a "privileged" strategic partner in the field. The Russian and Indian defence ministers signed a military-technical cooperation agreement in followup to the India-Russia Intergovernmental Commission for Military-Technical Cooperation (IRIGC-MTC), the Russian Defence Ministry press service said Monday. Indian Defence Minister Manohar Parrikar, following talks with his Russian counterpart Sergei Shoigu, called Moscow a "privileged" strategic partner in the field. "We have very close and strong connections in the area of defenсe. Russia has been and remains to date India’s leading partner," Parrikar, who arrived in Moscow for the IRIGC-MTC on Friday, said. Parrikar said earlier that he expected to sign an S-400 Triumf air defence system contract with Moscow. Cmdr. Abhijit Singh, serving officer of the Indian Navy, told Sputnik last week that New Delhi was planning to lease Russian-made Akula II-class submarines. Russia is among India’s foremost weapons suppliers. Over two-thirds of the Indian Army, Air Force and Navy military equipment is Russian- or Soviet-made.